I hope the nice lady in the bath is Budd Boetticher. If Indicator managed to get a deal with Warner Bros., a volume 3 of the Wonderful Worlds of Ray Harryhausen (which would really be a volume 4, since we started with Sinbad) could contain One Million Years BC, Valley of Gwangi and Clash of the Titans, all owned by Warner. What A Disgrace wrote: I hope the nice lady in the bath is Budd Boetticher. My hopes of it being Warners have basically totally lapsed - my expectation was the promise of something special for this Harryhausen set was going to be Gwangi, which'd be special due to it being the first title of a new deal, rather than it being special because Argonauts is universally viewed as the definitive if not the best Harryhausen. So now it'll probably be Fox or something that's not as exciting but given how amazingly interesting almost all of Indicator's releases have been so far will probably still be really great news (and I similarly hope, though it doesn't really impact me, that whatever license they sign allows them to continue making all of their releases totally region free). We'll probably be finding out in the next week or two, considering Indicator said we'd find out a few weeks later about a month ago, and so I wonder if that announcement will feature a preview list of some upcoming titles (Indicator more than most labels seems pretty loose with regards to upcoming releases this deal excepted and regularly answers questions about individual titles in Emails and Facebook and the like, so it'd not surprise me). Also it wasn't mentioned here but Indicator promised on Twitter that they will not be having a reduced slate for December, which probably means at the least it'll be the format of these past few months of 2 releases + a box. Ribs wrote: Also it wasn't mentioned here but Indicator promised on Twitter that they will not be having a reduced slate for December, which probably means at the least it'll be the format of these past few months of 2 releases + a box. It will indeed. And they've been completely upfront about the box being Hammer vol 2. Will December's slate be revealed soon? What A Disgrace wrote: Will December's slate be revealed soon? i saw my previous emails from Indicator, and it was around this time usually. I believe there's only one title being announced for December. We'll likely find out in the next week or so. Rapta is more accurate than Ribs. Mr. Deltoid wrote: An excellent choice for release! Good to see Indicator giving these previously neglected British titles (The Reckoning, The Deadly Affair, etc.) the attention they deserve. I only caught this for the first time about five years ago and it's a fantastic film, very evocative of it's time and place. I found the salon scene with Yootha Joyce to be much more terrifying than anything contained in Indicator's Hammer Box-set! "Neglected British titles" are a key part of Powerhouse's plan, so I'm very glad this has been noticed. For starters, they're easier to license from Sony as Sony themselves aren't especially interested in doing anything with them, and although they need to be counterbalanced with more commercially attractive titles I can honestly say that things like the August slate (The Deadly Affair, The Reckoning and the two Peter Nichols adaptations) were the most stimulating Powerhouse projects I'd worked on until Hammer volume 1 came along. And of course the Hammer boxes fall into the same category, especially as Sony's titles are amongst the studio's more obscure ones. I'd however be wary of using too many very dated hd masters. I know not everything is lavishly restored, and I know some movies might be perceived as worthy of a re-release, but something like The Reckoning HD master is really borderline HD worthy. Very happy about Clayton's The Pumpkin Eaters. I actually asked John about that one a while ago but never got a clear answer. Nice to have a surprise like this! Notice they mentioned there may be some sort of anniversary offer soon so may hold off pick-ups of recent titles like The Deadly Affair and See No Evil (the two I mostly want to catch up on). Interesting they mention there will be a 'number' of Jack Nicholson titles in the new year. Hopefully that includes The Missouri Breaks, but also one or two Monte Hellman would be nice. I'm also looking forward to Night of the Demon, which might be the 'special' edition they're teasing. Drucker wrote: Of course that may be your prerogative, Jack, but there are surely tons of people (like me!) that have never seen the film and even began buying films in the blu-ray era. This will be my first exposure to the film, I liked The Innocents, so I will check out this film I surely never would have paid a mind to unless Indicator released it. And surely I'm not the only one who really doesn't care about how much better it looks? It looks better - I wouldn't be able to watch the DVD knowing there's a version readily accesible that's got HD resolution that does a good job with probably the same master. They mentioned that the first non-Columbia titles will be coming in January, fwiw. rapta wrote: Interesting they mention there will be a 'number' of Jack Nicholson titles in the new year. Hopefully that includes The Missouri Breaks, but also one or two Monte Hellman would be nice. Where did they mention that? At facebook? I would also like a new scan of The Missouri Breaks, and also The Witches of Eastwick and maybe The Passenger. Later this month we celebrate our first anniversary. These first 12 months have been a whirlwind, and we've barely had time to pause and reflect on all that we’ve achieved in our first year. But, as we come to the end of the year and prepare for the next, we wanted to take a breath and thank everybody who has enthusiastically embraced what we have done so far. We take a great deal of pride in our work, and it's been incredibly rewarding to see our editions generate the positive feedback which they have on forums, in reviews, and via emails and social media messages. Your continued support is very much appreciated. In other news, we are absolutely thrilled to announce that our stand-alone release for the month of December will be Jack Clayton’s powerful, groundbreaking THE PUMPKIN EATER, starring Anne Bancroft, Peter Finch and James Mason. Making its world premiere on Blu-ray – complete with new extras and an extensive limited edition booklet – our INDICATOR edition is due for release on 4 December. As we look further ahead, we hope that you’ll continue to enjoy our releases in 2018. We'll be furthering our mission to release great films in high quality Blu-ray premiere editions, and the new year's slate will include a number of films starring the great Jack Nicholson, a range of box sets each collecting the work of some of America's most iconic and beloved filmmakers, a very special edition of what is perhaps British cinema’s most enduring and chilling horror classic, and much more besides. We've also now concluded a couple of fresh licensing deals with major studios, and we'll be revealing the first batch of these titles in next month's announcement. I also got that email, but didn't read it all. So, any idea what is "perhaps British cinema’s most enduring and chilling horror classic"? Also, what film do these photos of actors imply? By the way, like the Harryhausen boxes, I'd also hope for a couple of George Pal boxes! Night of the Demon seems like a good guess for British horror. Drucker wrote: Night of the Demon seems like a good guess for British horror. oh, right, yes, they had mentioned that. It's Never take sweets from a Stranger. Very pleased that "The Pumpkin Eater" is coming, which I've never seen but always wanted to. I thought the blurb was funny, as if we might only remember Maggie Smith if we had been daft enough to have gone to see "California Suite". MichaelB, do you know if they might be bringing "California Split to the UK, as I think I saw that the music rights that marred the otherwise excellent US DVD, have been settled. Well, depending on who they licensed from, it could be Village of the Damned (MGM). But we don't know who they licensed from, so it could be anything, and that goes for everything else from here on out. I am hoping that those boxed sets of films by most iconic and beloved film makers includes Budd Boetticher, but its more likely we'll get Howard Hawks, John Ford, Frank Capra and the like. Never Take Sweets From a Stranger seems to be regarded by few as the best of the Hammer films, and only "few" because its not widely seen. I believe it'll be part of Hammer Volume 2. I've expressed my doubts elsewhere that they've managed to wrangle The Passenger before Criterion got their hands on it, especially considering Criterion's relationship with Sony (whom would be involved in some capacity). The Witches of Eastwick is with Warner Bros, and as far as I'm aware they do not license to boutique labels - other than Criterion, they've only worked with BFI in the UK before, and only on very select titles (infamously refusing to let them release Russell's The Devils on Blu-ray, let alone uncut). The Missouri Breaks seems like a likely title for Indicator to go for since they've released a couple of Penn titles already (Mickey One, The Chase), as well as having released films starring Nicholson and Quaid (The Last Detail) and Brando (The Chase). A deal with MGM therefore looks likely, which isn't surprising as other UK labels have been doing just that for years (e.g. Eureka, Arrow, Second Sight, Signal One etc). What's interesting is that in the newsletter they mention 'a couple of fresh licensing deals with major studios'. That'll most likely include Fox as well then, again similar to how Arrow/Eureka/Signal One have operated in recent years in regards to licenses from either studio. Let the guesswork commence...will be interesting to see which titles they're doing that Arrow/Eureka wouldn't already be gunning for. PS: I hope they can eventually crack the Paramount library, unless Eureka are confident in doing that themselves, if only to pick up the titles they missed before (especially many of the recent restorations Olive have released in the States, such as Johnny Guitar and High Noon). Yes, and they had already teased it would get a 'special' release in various comments on social media. I reckon they plan on doing both cuts, and perhaps it will spill onto two separate discs, or have a thicker booklet than usual. Or even better, be coupled with Tourneur's Nightfall (released the same year). tojoed wrote: MichaelB, do you know if they might be bringing "California Split to the UK, as I think I saw that the music rights that marred the otherwise excellent US DVD, have been settled. Similar to The Pumpkin Eaters, amongst many others, this was another Columbia title I had enquired about. I think there are rumblings about Criterion releasing it though, which would make sense considering the number of Altman titles they've been putting out in the last couple of years. Can't wait to see it restored, and hope they also port it to the UK at the same time, as it's one of my favourite Altman titles (from what I've seen so far). What A Disgrace wrote: Well, depending on who they licensed from, it could be Village of the Damned (MGM). But we don't know who they licensed from, so it could be anything, and that goes for everything else from here on out. Village of the Damned was already released by Fabulous Films a few years ago, I'm afraid. It's more likely referring to Night of the Demon, a title that has been asked about quite frequently over the past year or so, and which Indicator have already mentioned they have special plans for. As for the box sets, they've already confirmed to myself and others that they have some Boetticher lined up, and I assume they'd collect those into a box set. 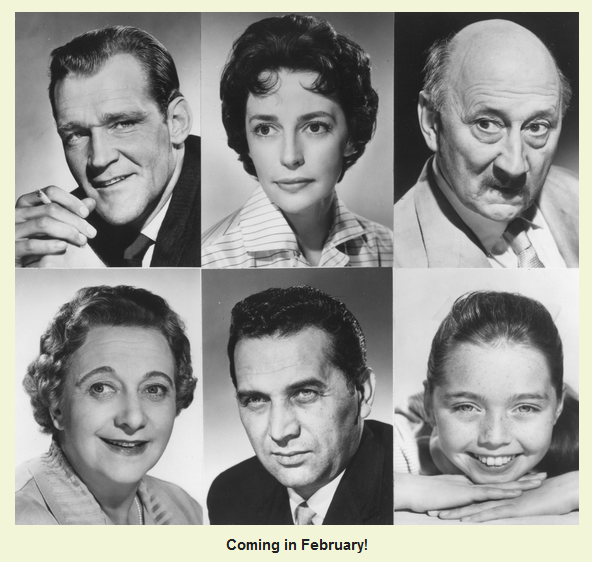 They've also confirmed a William Castle set, but no idea about any other singular filmmakers. Capra is someone I did ask about, but I seem to remember them implying that Sony wouldn't let them have any of those, so perhaps Sony themselves plan on releasing some via other means. They've literally just announced Lost Horizon as an HMV exclusive, so could do the same for You Can't Take it With You, Mr Smith Goes to Washington and Mr Deeds Goes to Town. Indicator have a better chance of getting American Madness or The Bitter Tea of General Yen, but probably not enough to do a box set. Ribs wrote: And surely I'm not the only one who really doesn't care about how much better it looks? It looks better - I wouldn't be able to watch the DVD knowing there's a version readily accesible that's got HD resolution that does a good job with probably the same master. I've very quickly stopped thinking in terms of upgrade vs the DVD especially since I've never seen most of the movies I buy ever before getting them on BD. I'm just evaluating PQs intrinsequely and I'm thus not interested in BDs just being at least better than the DVD. It's BD. It should be at least "good" not just watchable. In the present case (pre existing HD masters), that'd be the difference between a correct one and a rubbish Universal one, for instance. In some cases, it being in HD doesnt mean it looks good enough for a BD release. And I'm not even talking about how incorrect the older color timing used to be. Again, I'm not trying to look too picky, or to minimize some releases. It's just I don't particularly wish to buy average BD, I expect more of them, and now that I know how mediocre some old HD masters used by Indicator can be, I won't be blind-preordering so easily their releases which are based on "High def remaster". Last edited by tenia on Thu Oct 12, 2017 1:43 pm, edited 1 time in total. With Night of the Demon being mentioned, can I just pop into say that I'd love a box set of Tourneur's westerns? I have no idea what the rights situations are, so if anyone can raise or dash my hopes it'd be appreciated. rapta wrote: What's interesting is that in the newsletter they mention 'a couple of fresh licensing deals with major studios'. That'll most likely include Fox as well then, again similar to how Arrow/Eureka/Signal One have operated in recent years in regards to licenses from either studio. Let the guesswork commence...will be interesting to see which titles they're doing that Arrow/Eureka wouldn't already be gunning for. If Kino could do a deal with Disney, couldn't Indicator too? I would love such a deal. Ribs wrote: So... considering TT is releasing Bob & Carol & Ted & Alice, does that mean that the shelf might have included titles Criterion was only circling rather than just being stuff in active development? Or simply stuff for background research. I'm going to be ploughing through a fair chunk of Jack Nicholson's back catalogue very soon, but Powerhouse only has three actual titles to my knowledge*. Ditto Hammer, as I seriously need to brush up on their psychological thrillers. The Fortune is pretty much exactly up Indicator's wheelhouse, and the guess from that thread of As Good as It Gets (both Sony) seems very feasible as well (though not really Indicator's "type"), but assuming Wolf is included in that count seems fairly unlikely to me. Makes me a tad hopeful one of the deals they have might be for the ABC Pictures titles, just to see if they're able to get a good release of Prizzi's Honor. On the other hand, that's also going off the assumption he's not including The Last Detail! Last edited by Ribs on Mon Oct 16, 2017 5:04 pm, edited 1 time in total.